(NaturalNews) Some of the most popular American corporations are importing shrimp at super-cheap prices from Thailand, where migrant workers are in slavery, like in Nazi Germany, being tortured while they work for no pay 20 hours a day. How much shrimp is being imported that's processed by slaves, including child slaves? Walmart and Costco are contributing to the chaos, buying and selling shrimp exported from Thailand every year, and it's slave-labor shrimp at "rock bottom" cost. No wonder Walmart and Costco are such "successful" businesses. What else are they buying that's made by slaves who are tortured mentally and physically while working 20-hour days for zero pay? Wine, maybe? No wonder these massive corporations can afford to advertise regularly on TV. Now you see. Now you see what corporations are really doing to America, supporting this, and adding to the "behind-closed-doors" slavery, much like Nazi Germany 75 years ago. Are you a criminal if you know about criminal activity and still give the perpetrators your money? Now we all see where real advertising revenue is generated -- by selling super-cheap shrimp, and we're talking about FARM-RAISED shrimp that are fed toxic non-edible seafood and processed by tortured slaves. No wonder these huge American corporations can afford to advertise, during prime time, or during the Superbowl, and have billboards near every major highway exit, and full-page/full-color ads on the back page of newspapers. A 2013 report by the Environmental Justice Foundation (EJF) titled "The Hidden Cost: Human Rights Abuses in Thailand's Shrimp Industry" notes that the country is the largest exporter of shrimp in the world, exporting over 392,000 tons in 2011; 46 percent of that shrimp went to the U.S., while Thailand accounted for more than 10 percent of Europe's total shrimp imports. "The shrimp industry is heavily reliant on migrant workers, many of whom are trafficked and face arduous journeys before having to endure abusive conditions in Thailand's exploitative shrimp factories," the report said. "Due to a desire to keep costs as low as possible, major exporting companies often subcontract to external pre-processing facilities. These facilities, also referred to as 'peeling sheds', remove the heads, veins and hard shell of shrimp and prepare it for secondary or value-added processing. This pre-processing stage of production is the most labor-intensive and least regulated aspect of an otherwise sophisticated supply chain. This informal nature makes it particularly prone to poor working conditions, breaches of national and international labor standards, child and forced labor, exploitation and abuse." Pricing shrimp on the "open market"
Get your slavery shrimp right here, extra large (farm raised) raw, peeled and de-veined! So then, Wally World (Walmart) can't even sell "slavery shrimp" without shorting the customer some pieces? Are you price shopping or "value" shopping? Look! Two pounds of tail-off shrimp under 16 bucks! Wow. How do they continue to price so low? You can't get half of that in a restaurant. Do you have a membership to the slave-labor support group? Maybe you should NEVER get one or cancel yours now. "Tossed the rest of the box"? 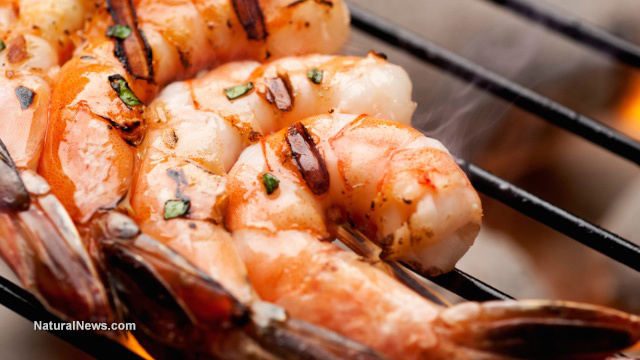 She threw out 80% of Costco's shrimp, but why? -- Because the "normal taste" and "texture" is not there! Sounds like a major problem for Thailand and their "pre-processing" concentration camps.